The Abeka Flash-a-Card series is one of the best picture resources available for Bible classes. The pictures are realistic and vivid. A manual that identifies each picture is included. Cards are 12" wide x 15.5" tall Recommended for full-size classrooms, resource room collections, etc. 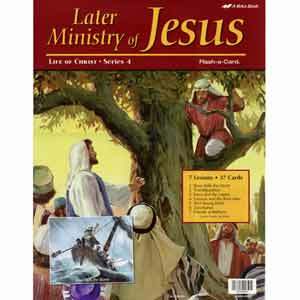 Booklet Bible Stories are 8.5" wide x 11" tall Recommended for mission work, very small classes, homeschool, etc. Recommendation: The manual that come with the cards contain denominational doctrine. If cards will be available for congregational use, use the books to write on the back of each picture a caption identifying the picture. Then discard the books so no one has to sort through the error.